My Typo Humour: WTF is that doing there? WTF is that doing there? For those of you with a sensitive nature, please look away now. 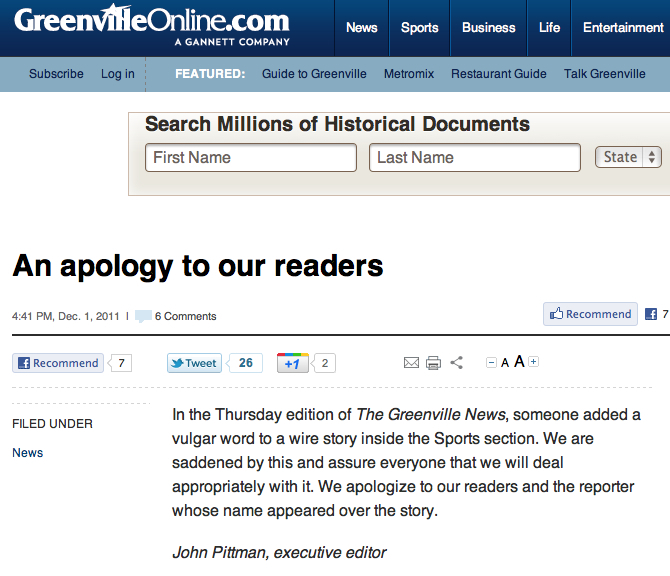 A small but significant piece of text somehow popped up in an article which was printed in last Thursday's edition of The Greenville News, South Carolina's daily morning paper. By the way, someone else has highlighted it, not me. I think it's clear enough without. 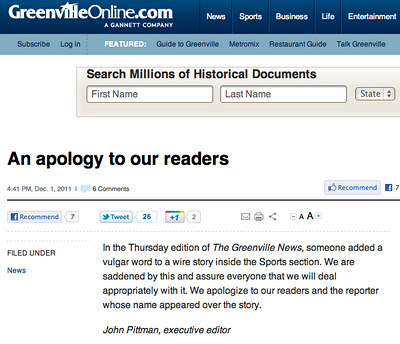 An apology appeared on the paper's website later the same day. So, what's the story here? A disgruntled employee? An intoxicated sub editor? I don't suppose we'll ever find out but it certainly smacks of axe grinding to me. I see that the report comes via The Associated Press, the organisation that produces the widely-used AP Stylebook, the reference book on standards used by broadcasters, magazines and public relations businesses the world over. It includes sections on capitalisation, abbreviation, spelling, numerals and usage. F*ck knows if it includes a section on this issue. At least Paul Newberry, the AP Sports Writer and innocent author of the article (without the addition), saw the funny side of it. The next post will be at 6am this Wednesday when I'll be finding a more subtle message than this one in a newspaper article. Join me on Facebook or twitter to be among the first to see it. The links are at the top of the page.